The Nigerian National Soccer team, Super Eagles have slipped to the 44th position in the latest FIFA ranking irrespective of the 5-1 aggregate defeat of the Indomitable Lions of Cameroon in the 2018 World Cup qualifying matches. 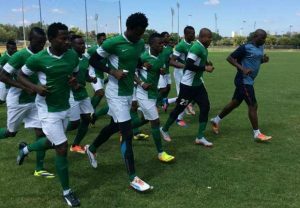 The Nigerian team dropped from 38th position it occupied in August to the current 44th placed in the overall FIFA World ranking released on Thursday. The Eagles moved one spot from their initial 6th to occupy the 5th place in Africa, in the September ranking, while Egypt, Tunisia, Senegal and Congo DR occupied the first, second, third and fourth positions respectively. Egypt retained their number one spot in spite falling five places in the overall ranking, as Cape Verde turned the biggest overall movers in the world rankings climbing a total of 47 places. Cape Verde’s two victories over South Africa in 2018 World Cup qualifying saw them move from 114 to 67 globally and 13th in Africa. Tunisia replaced DR Congo as the second-ranked side in Africa after the Carthage Eagles defeated the Leopards and drew with them in the 2018 World Cup qualifying matches. DR Congo fell 14 places globally to occupy the fourth position on the continent behind third-placed Senegal. Germany returned to the number one spot ahead of Brazil, while Portugal and Argentina occupy the third and fourth place respectively.